I started out my trip in Oregon flying into Portland and headed to Bend to visit my friend Karen. The drive was beautiful and I wish I had scheduled some time to stop and take some pictures. It really was a whirlwind trip! I got into town, we headed to a baseball game and then hit downtown. We had a blast! Bend is adorable and I really miss Karen! Good thing she’s coming down this summer! The amazing view from look out point. This breakfast place was sooo yummy! Just what the morning called for! 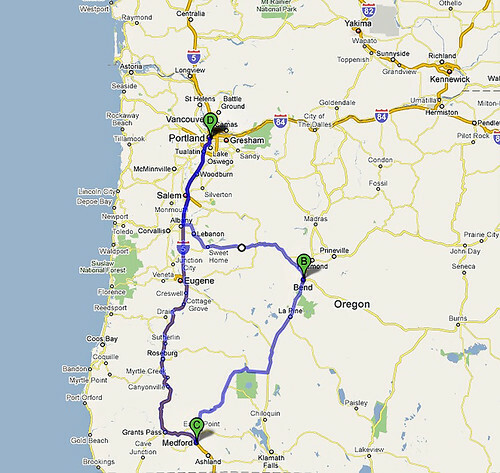 On Saturday I drove to Medford to visit Shelly. The drive was beautiful! I drove by Crater lake on the way to Medford. I arrived just in time for Shelly’s Baby shower for Baby Brody! It was nice to meet all of Shelly’s friends & family in Medford. On Father’s day we took Roland wine tasting. I love Roxy Ann Winery. It was so good. I’m still kicking myself for not buying that Pear wine. I know Shelly & Roland are going to have so much fun going there for happy hour!